Department of Electrical and Electronic Engineering, Centre for Terahertz Science and Engineering, Imperial College London, London, U.K. The growing and vibrant Terahertz R&D community is creating major breakthroughs in science & engineering and now offers the realistic prospect of commercial exploitation for niche applications. Atmospheric attenuation has a critical impact on free-space THz applications, ranging from metrology in the laboratory to hitting the perceived 'THz brick wall' in any future spectral expansion beyond 5G. 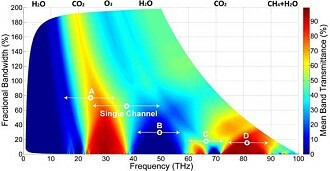 Moreover, further exploration within the 'Over the THz Horizon' thermal infrared, in spectral bands that can have relatively low atmospheric attenuation, will also yield new opportunities for commercial exploitation. For decades, the atmospheric science community has been characterizing atmospheric attenuation over be-spoke path links. However, outside of this community, THz technologists and practitioners may not have exploited the wealth of knowledge and modelling software that exists. This entry-level article was written from an engineer's perspective and represents both a mini-Review and research-led Technical Note. Of practical significance, with different scenarios under pristine conditions, we show how a freely available and easy to use online software package can qualitatively predict atmospheric attenuation and how the results from this convenient tool compare with quantitative predictions from more sophisticated software packages. Jingye Sun: Department of Electrical and Electronic Engineering, Centre for Terahertz Science and Engineering, Imperial College London, London, U.K.
Fangjing Hu: Department of Electrical and Electronic Engineering, Centre for Terahertz Science and Engineering, Imperial College London, London, U.K.
Stepan Lucyszyn: Department of Electrical and Electronic Engineering, Centre for Terahertz Science and Engineering, Imperial College London, London, U.K.
Imperial College London, London, U.K.